tea's on at FHC ~ see you soon.. 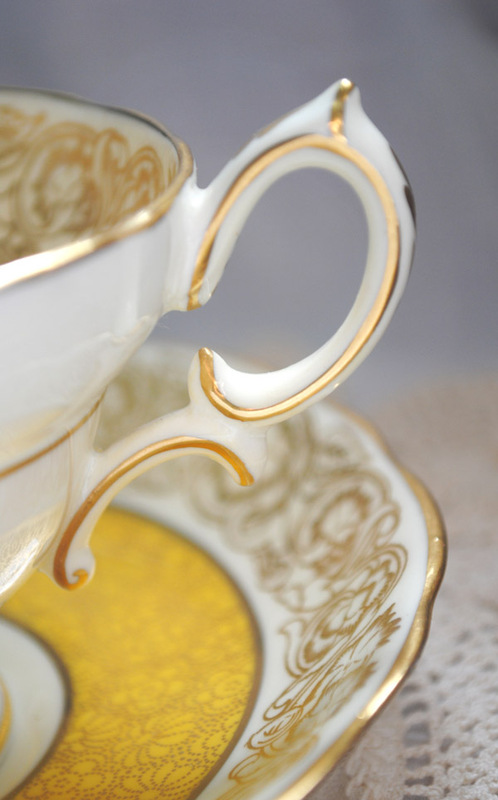 I love your teacups and this one is gorgeous! Hi , I joined again today! I really love it! Thank you! Yes, yellow is special in a cup and I am not particularly a yellow person. 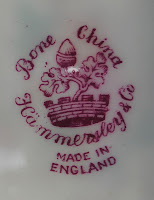 This cup is lovely and Bone China makes it nicer yet. 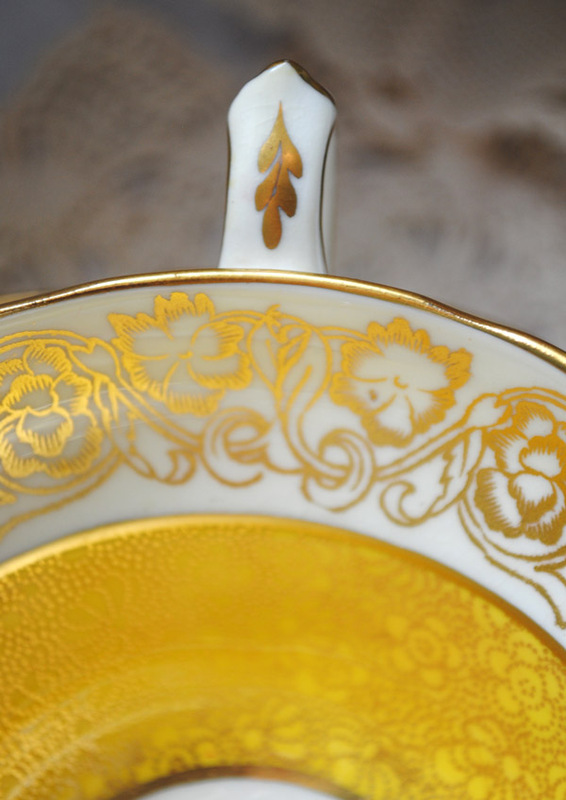 I do love yellow teacups too. This one is a beauty. Thank you for hosting. Hi Terri! Yes, your yellow tea cup is cheerful. Just perfect for a cold and snowy morning! Happy Thanksgiving!! 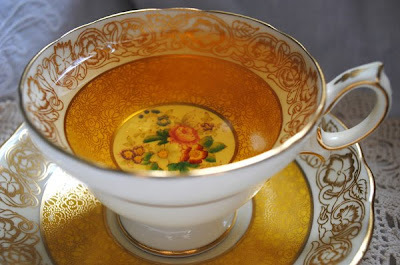 What a beautiful teacup, and Chamomile tea is one of my favorites! With three boys I need all the relaxation I can get! Just beautiful. Have a wonderful Thanksgiving! Hi Terri, I got to thank you for being my eye opener on yellow teacups! 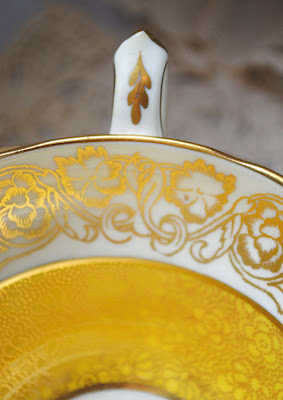 I dont really like yellow for teacups but after I saw yours and few others, I am starting to fall in love with yellow.. this week your teacup is stunning! love it a lot!.. thanks for sharing and hosting. happy thanksgiving too! Good Morning Terri - I did enjoy viewing your pretty dainty yellow gold teacup. The handle is so girly! Wishing you a happy Thanksgiving and thanks for hosting! oh this is so so wonderful!!!! I love this special tea cup!!!! gorgeous!!!! Terri, this is exquisite!! I think I ran out of cups to share! But it's always fun to see what others have posted. Hugs and Happy Thanksgiving to you! Such a stunning teacup..the handle looks so delicate. Very genteel! I am really late today! 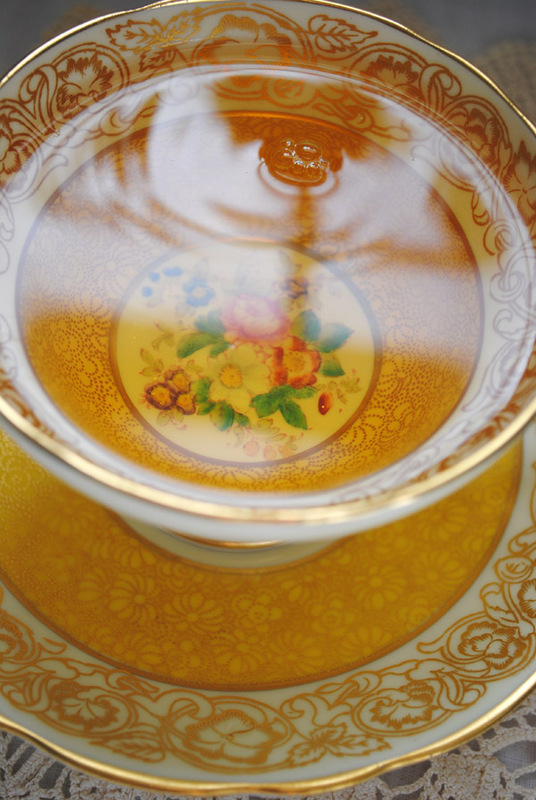 Your teacup really is a beauty! Very ornate and very lovely to sip tea from! Thank you for sharing and a Very Happy Thanksgiving to you and your family. Very pretty tea cup. Happy Thanksgiving! Thanks for stopping by and wishing me a happy Thanksgiving. I want to wish you one, too. I've had my head buried in swap obligations for a couple of weeks and have been practically nowhere. Thanks for stopping by because it meant a great deal to me. I hope your Thanksgiving is wonderful and safe. This tea cup is enchanting. 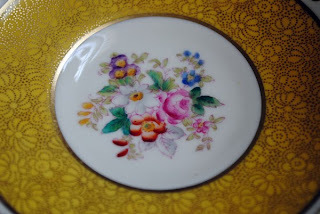 I do love yellow teacups also! such a lovely cup! I would love to see your gorgeous collection in real life - I know my jaw would drop! Have a wonderful week! Hi Terri..oh my ..another charmer...i love this photo series you did..wow..and having tea in it..gorgeous and creative,and stunning! I love yellow too..such a magical glow! Absolutely gorgeous, and I think it's awesome to celebrate teacups! Hi Terri! I'm so happy you stopped by to see me! 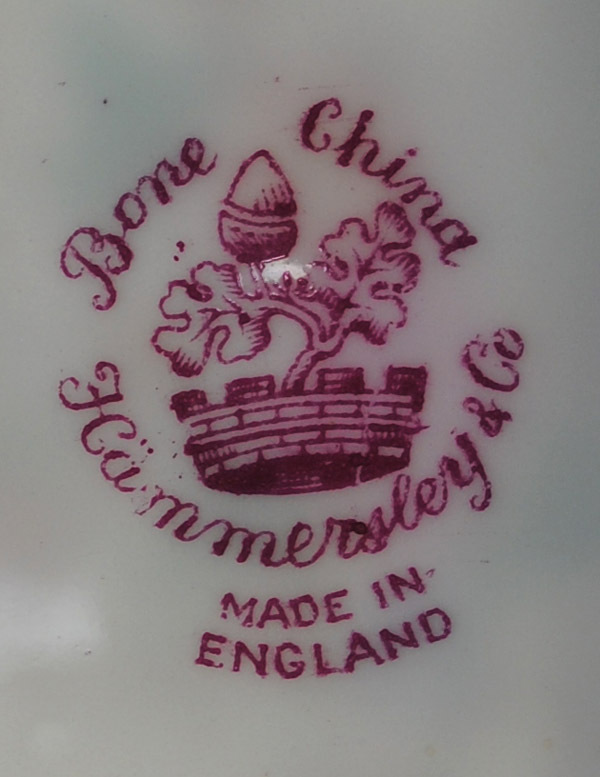 I loved your pretty cup and the history of it. Your blog is a delicious escape and I will be back! Hugs!